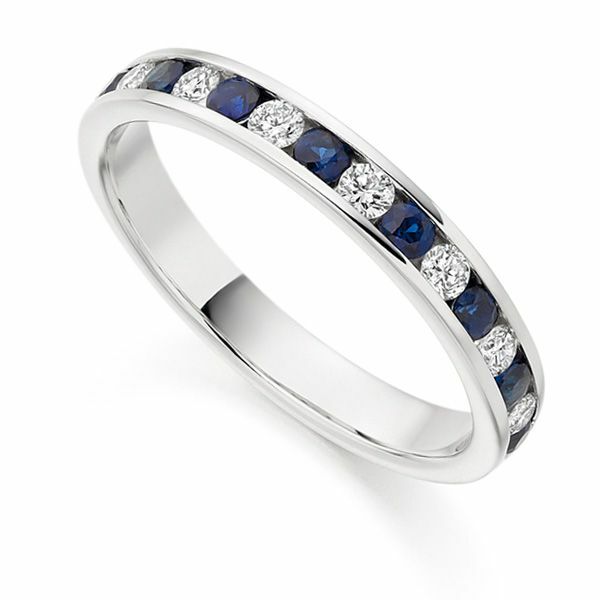 Elegant round diamond (0.27cts) and blue sapphire (0.36cts) half eternity ring with channel setting within a 3mm rig design. The channel setting within this Diamond Eternity Ring (or wedding ring) benefits from a streamlined appearance. Alternating blue Sapphires contrast between ice white (F Colour) Diamonds of exceptional Clarity (VS1). Set with 0.27cts of white Diamonds, and 0.33cts of blue Sapphires the ring achieves a gemstone carat weight of 0.60cts. Crafted with a substantial 3mm band this Eternity or Wedding Ring offers comfort and style, set with intensely bright, fully faceted Sapphires and Diamonds perfectly matched and precision set. Please allow 4 weeks for this ring style to be created to order. Showing an example of this exceptional design, beautifully boxed and shown off in our luxury packaging.